Tribute to Cactoblastis caterpillar which was introduced from South America to eat out the prickly-pear cactus that was invading agricultural land. Early in the twentieth century, wide areas of New South Wales and Southern Queensland were very thickly covered with infestations of the cactus Opuntia inermis (prickly pear), and were rendered almost useless for agricultural and pastoral activities. An American moth, Cactoblastis cactorum, was imported to Australia to combat this pest, as females lay their eggs on the pear, and the caterpillars feed on it. The moth had a spectacular success in controlling this weed, and populations of them are still to be found in Australia, keeping the numbers of Opuntia under control. A committee formed at Boonarga to build a hall there considers that the cactoblastis insect is responsible for the hall being built and it has been decided to call the hall the Cactoblastis Memorial Hall. 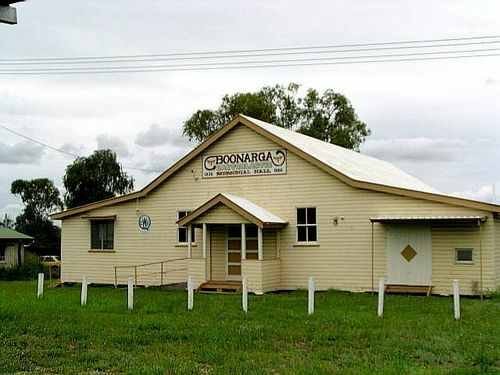 Boonarga, a siding on the railway line seven miles east of Chinchilla, was formerly noted by railway travellers because of the height of the pear. To-day the cactoblastis has almost eradicated it, and a great deal of the land is now taken up by new settlers and proving good country both for dairying and agriculture. The Queenslander (Brisbane), 15 November 1934.